Following the official release of Redmi Note 7 and the announcement of Redmi Note 7 Pro, Lei Jun (Xiaomi CEO) and Lu Weibing (Redmi’s President) both confirmed the existence of the Redmi 7. 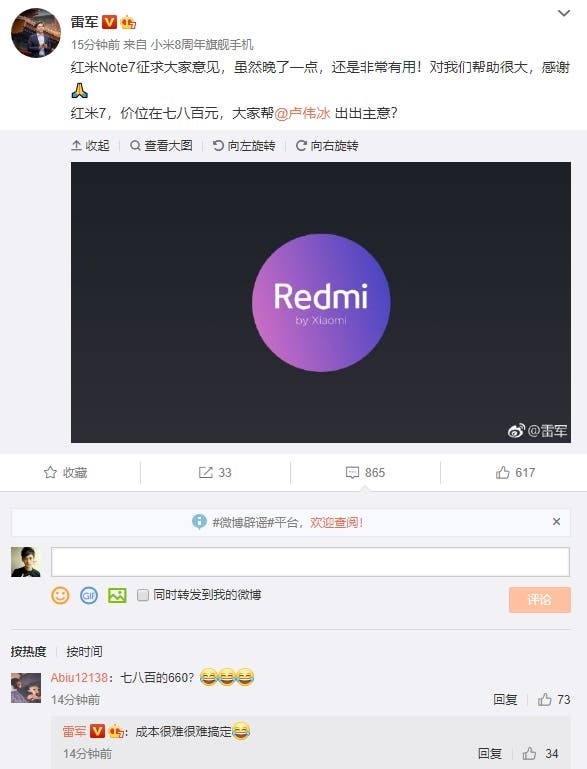 Lei Jun revealed this morning that the price of Redmi 7 is between 700 Yuan ($104) and 800 Yuan ($119). In addition, Lu Weibing said that the cost of this smartphone is very difficult to fix but he gave a smile with a nod when a netizen suggested 700 Yuan ($104). For the Redmi 7, Redmi is hoping to include some features which will make this smartphone convenient for the elderly. Perhaps “, “eye protection screen”, “standard charger” and so on. The Redmi 7 is more likely to use either Snapdragon 636 or Helio P60. Definitely, it is a smartphone with a price/performance ratio. However, we don’t expect to see features such as dual-glass, USB Type-C, and a 48MP camera that was used in the Redmi Note 7.